If you visit Google Maps Labs you will notice they have added some features. The most exciting new feature for me is the use of Google's URL shortener for the "link" button. For example, I can now link to my business's location using http://goo.gl/maps/rNAh instead of a really long and hard to read URL. 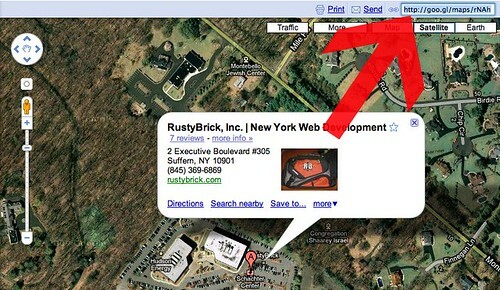 To activate this feature, go to Google Maps Labs and click enable for the "Short URL" feature. Then load Google Maps and check it out. An other new feature mentioned by Websonic in the Google Blogoscoped Forums was the "Show Me Here! : Adds an option to the context menu that lets you zoom directly to the maximum zoom level at the point under the cursor."